Last October, the first ever Qatari-produced movie premiered. 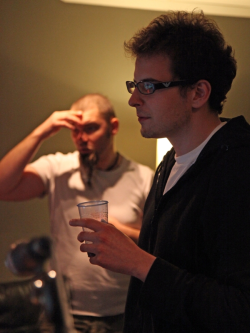 The musical score was written by a 24 year old Pole, Maciej Dobrowolski. 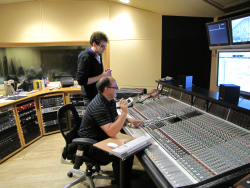 In the Warsaw recording studio Sound Tropez, with his full feature debut playing from the speakers, he spoke about his beginnings as a composer and working on "Clockwise". Maciej Dobrowolski: Probably when I saw The Rock (1996) in the cinema. There is a scene shot in slow motion where the main character fires flares to stop a missile attack. I was blown away by the scene, mainly because of the amazing music by Hans Zimmer. Also, when I was little, I used to draw a lot and at that time I would always listen to the cassette with James Horner's score for Titanic. I listened to it for hours every day. I also remember that I read the whole Lord of the Rings trilogy while listening to that. I was stunned by the themes and the beauty of the music. It's actually quite funny, because whenever I hear the Titanic score I immediately think of The Lord of the Rings. Anyway, it took me some time to realize that I was actually more interested in the music I was hearing than the drawings I was doing. I've read on your blog that you were 15 when the soundtrack to The Rock influenced you to become a film composer. Why a film composer in particular and how did you come to the decision at such a young age? I just really got into it. At that time I was playing bass guitar a lot - mostly heavy metal music, but I kept going back to film music which, with soundtracks like Titanic and The Rock, was a constant presence in my life. The soundtracks of films like The Perfect Storm, Deep Blue Sea, Conan the Barbarian or Sinbad literally accompanied me everywhere. I remember when I went to holiday camps, or even just on short trips, I'd take dozens of CDs with me. Soon, listening stopped being enough and I started writing short themes in a MIDI sequencer, imitating Zimmer's style. At the beginning I was writing them for myself, just casually, but every single piece was telling me: "Yeah, that's it". I've also read you are self-taught. Yes and no. I taught myself to write music, but not to play instruments. My grandfather was a pianist and my dad was thinking of studying conducting..., so when I was little my parents signed me up for piano lessons. Unfortunately, I couldn't put up with it for very long, so I quit. Then, as I said, I started to play bass. I also signed up for private music school. I went there for 3 years, playing classical guitar. Then I started playing the piano, which became my main instrument after a while. I have been going to private lessons for a few years, which I think is the best solution for me - concerts and performances always stressed me out a lot. When did you start to think of yourself as a composer? Ever since I started to write those first MIDI tracks, I think, though of course I'm aware they were far from perfect. I worked on my first major project shortly after that, writing a short piece for an internet commercial. I was recommended by a friend who had been working on the project. I sent them a demo reel and I was hired. Then I started writing music for low budget movies. The first movie I scored was called Warsaw. The director, Adam Zych, found my website and after listening to some of my tracks, he called me and asked if I was interested in writing the score. How do you recall working on this film? It was a peculiar movie, mostly because of its form - the narrative was visual only. On a certain level the story was visible, and on another level the music had to bring it out. So, for a first assignment, the job wasn't easy. I remember that, with the first version, Adam had reservations about the musical structure. The second version was accepted and then the only question was of fleshing the sound out, which is a very tedious and tiring process when you are working with samples. It was the first project where I'd worked with images, so I had to learn everything from the basics up - how to work with video at all, how to hit synchronization points, etc. It was a baptism of fire. I was wondering, what does your creative process look like... how do you approach writing music? When I started, I just wrote spontaneously. I'd load the clip into my music software, watch it a couple of times and just start playing, looking for something distinctive in the music to convey the mood of the scene - an interval, a rhythm or just a timbre. That's partly why I am so obsessed with sample libraries - I find the sound itself very inspiring. Anyway, I had a totally different approach with Clockwise, mostly because of the amount of music I had to write. The score had to be well thought out. Since the movie begins and ends in modern times, the first thing I wanted to illustrate musically was the transition in time, between the present and the 1920s. That is how I wrote the pieces "Clockwise" and "The Journey Ends". The latter piece incorporates some of the melodic material from the retrospective part of the movie - such as the Jeena's Theme. After that, I picked and scored a couple of scenes to outline the emotions in the score - fear, love, loneliness and, based on that, I wrote all the small cues and underscore. It's a long story. It all started when the director, Khalifa Almuraikhi found my website. He liked my earlier compositions and emailed me, saying: "I'm making a movie and I need a score". I sent him some demos and I got hired shortly after that. After watching the movie with a good friend of mine, Pawel Stroinski, who has a great feel for movie narrative, we compiled a temp-track to get a feel for the movie, to see how different music works in different scenes. It was a very interesting and instructive experience, because I could really see how music shapes and influences the film narrative. Then I started writing the first sketches. I was working remotely, I couldn't just sit with the director and discuss the movie, at least in the beginning. Some time later, I was given a music supervisor, Roland Heap, who used to be connected with the famous London Abbey Road Studios and assisted with recordings for many famous composers, like the fantastic rejected Gabriel Yared score to Troy. It was a fantastic experience, I really learned a lot from Roland. We were in contact on a daily basis, discussing the cues and scenes over Skype. One day during his visit to Poland, he told me that we don't have to be in such a hurry, because the deadlines had been moved back and the musical concept changed a bit. In April 2010 I got a DVD with the final cut of the movie, which was very different from the one I'd been working with. Apart from one theme, what I'd written already didn't fit any more, so I started from scratch. I had a bit over a month to write the score. I was stressed out, because it constantly needed more and more music. At first we thought the score would run to just over 30 minutes, because a lot of traditional fjiri music is used in the movie, but it ended up being 54 minutes long. So you already have enough for an album and, from what I can hear, it would really be worth releasing it. There are the melodies, some lovely vocals, plus a bit of an oriental touch. This music has a soul. Thank you very much. There has been some interest in the score, but I don't want to speak too soon. Did you find it easy to write so much music? There were a couple of scenes that were a bit problematic musically, but generally, it was a very pleasant experience and I didn't have many problems. There is a quite long action sequence towards the end of the movie, which is underscored non-stop for about 10 minutes. To be honest, I was intimidated by the length and pace of that cue, but in the end, I wrote it in about three days. All the themes I am most proud of (Jeena's Theme, Main Titles) were written during the first couple of days of work. I'm guessing you earned a lot working on this project? Actually, not that much. I spent the whole down payment on the sample libraries I used later for the project. The budget for the movie and the score wasn't very big. From what we were told, it was a miracle that we managed to record a score like this on the kind of budget we had. I had an amazing crew - wonderful soloists, producers, a great string orchestra (Sinfonia Viva), conductor (Krzysztof Herdzin - the orchestrator of Finding Neverland) and probably the best recording studio in Poland, the Polish Radio Studio in Warsaw. What should characterize a composer who wants to write really good film music? I'm not sure if I can already give any characteristics... It certainly has to be somebody sensitive when it comes to images, colours and emotions. It needs to be somebody who understands the movie and narrative, and who can put the effort into imagining how the film will look like as a whole with the music, knowing how the music will affect the viewer emotionally. I asked you about that, because I think you have those characteristics. Just as, for example, Michal Lorenc. I don't know if you are aware of that, but you have something more in common with him - he is a self taught composer as well. I read in an interview with him that the lack of music education causes a sort of creative anxiety inside his mind. Do you have similar complexes? To some extent yes. This is probably what motivates me to keep on educating myself, reading and studying scoring techniques. I console myself with the fact, that there are a couple of composers with no music education who have made impressive careers for themselves - Michal Lorenc, who you've already mentioned, Jan A.P. Kaczmarek, and of course Hans Zimmer, who I've always admired. I think that the composers who don't have the usual musical education are characterized by the fact that when they write they put the emphasis on emotions and you can hear that. Composers with formal education approach music intellectually, from a technical point of view. I think it's more personality than education, but you might be partly right. I read a statement from Thomas Newman once (an educated composer), where he said that he can take a week to write a minute of music. What he wants is for every second of it to have something special about it, for emotions to come out of it. He wants the music to bring something in and serve the film. I understand that and want to follow his method. My technique is limited and I can't fully trust it. It of course doesn't mean that I'm completely ignorant. Theoretically, I know what to do, I read a lot. It's not that I have no technique at all. Do you connect your future purely with film music? There is no backup plan for me, really, in my life everything revolves around music. I have connected my future with film music for a very long time now, but only now those hopes started to gain a foundation. I aim high, but I can always resort to smaller projects. 90% of what I earn, mostly on smaller, more commercial projects, is invested back into my work, I buy new equipment, samples or educate myself through internet courses at Berklee Music. I don't want to do anything else, only music gives me this much satisfaction. Do you believe you can make a living from it? Yes! Debuting is the worst and that I already have behind me. That's the most important, because I can show a recorded orchestral score that I wrote. During the process I heard a lot of very positive opinions from people who worked on the movie. I know if my sketches for Clockwise hadn't been liked by Khalifa or Roland I would have been off the team very quickly. It didn't happen. That gives me a great deal of self confidence. You have not yet made a debut in Poland. I think my debut in Poland will come eventually. The only thing I care about now is scoring another movie. There are so many interesting projects around the world, I do not want to limit myself to Poland. My experience with remote work has been nothing but great, so I don't see any reason why I shouldn't work this way again.